The Tryon Palace certainly stands out in a city known for its outstanding historic homes and buildings. The original buildings were built in the late 1760s. 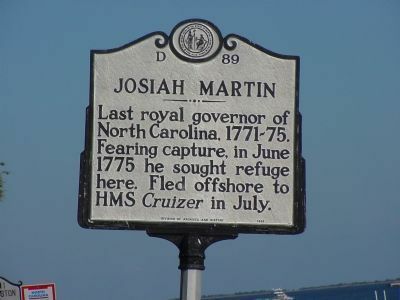 It served as the first permanent capital of North Carolina, which at the time was still a colony of England. William Tryon was the Royal Governor at the time and he brought architect John Hawks from England over to design the mansion. 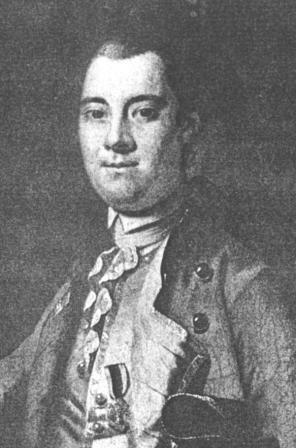 John Hawks was the first trained architect in North Carolina and one of only a few in the colonies at the time. In addition to the Palace Hawks was involved in many other works in New Bern and the surrounding areas. Governor Tryon, his wife Margaret Wake Tryon, and their daughter Margaret, lived in the Palace for just over a year. They left New Bern in June 1771, when Governor Tryon was appointed to the governorship of New York. Revolutionary patriots made the Palace their capital and the first sessions of the General assembly were held there. A total of four North Carolina Governors used the Palace as their residence. 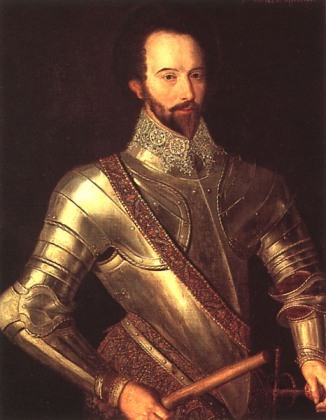 Raleigh, named after Sir Walter Raleigh shown in the picture above, became the capital of NC in 1794. 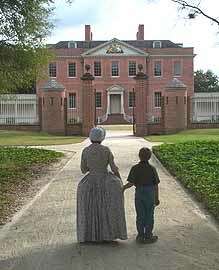 Other than being rented out on occasion, the Tryon Palace was rarely used. In 1794 a fire started in the cellar and destroyed the main building. In the 19th century George Street was extended over the original Palace foundation and homes and businesses were built on the Palace site. At the end of the street a bridge crossed the Trent River. Eventually the Palace was all but forgotten about. In the 1930s a movement began to restore North Carolina’s first capitol. The movement gained strength when volunteers tracked down John Hawks' original architectural plans. In 1944, Mrs. James Edwin Latham, a Greensboro resident and native of New Bern, challenged the State of North Carolina to join her in restoring the Palace. She guaranteed her commitment through establishment of a trust fund dedicated solely to the Palace restoration. In 1945, the legislature created the Tryon Palace Commission, a body of 25 persons appointed by the governor, and charged it with the reconstruction of the original Palace from its original plans on its original foundation. As part its commitment, the state further agreed to maintain and operate the restoration when it opened to the public. 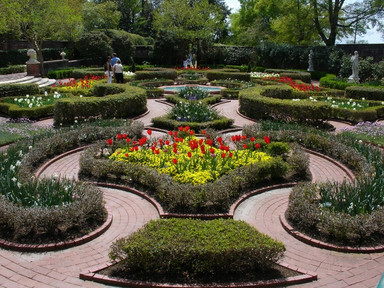 part of the restoration project was the Palace gardens shown below. Mrs. Latham died in 1951, shortly before the reconstruction of the Palace began. Her daughter, Mrs. Mae Gordon Kellenberger, took on leadership of the restoration. The first restoration challenge was to clear the site. This involved removing more than 50 buildings and rerouting North Carolina Route 70, including a bridge over the Trent River. Archaeological digs followed. They soon uncovered the original Palace foundations, directly under the site that the highway had occupied. Layers of stucco were removed from the stable office, the only remaining part of the 1770 complex. Then the painstaking job of reconstructing the Palace began. Craftspeople from across the country and abroad were brought in to do the work. In the meantime, trips to England yielded furnishings appropriate to the period of the original Palace. Earnings from Mrs. Latham’s trust underwrote all of these time-consuming and costly tasks. The Palace was opened to the public in April 1959, as North Carolina’s first great public history project. The furnishings at the Palace are primarily English. Governor Tryon made a very detailed inventory of his possessions following the destruction by fire of his later home at Fort George, New York. This inventory, which revealed the Tryons' taste in furnishings, was used as a guide in refurbishing the reconstructed Palace. Guides in period dress conduct tours of the building. Both floors are open, as well as the cellar, which has recently been reinterpreted according to descriptions contained in some of architect John Hawk’s letters.